When I wrote about our rally through Kerala in an old Ambassador car this time last year, I explained how I adored old cars. I worked in the classic car industry some years ago and I fell in love - simple as that. Luckily for me I have a German friend who owns a few lovely motors that we occasionally go out in together. Last time we met, we 'drove' (she drives, I navigate) her fantastic 1949 Jaguar XK120 in and around Kitzbuhel in Austria in the Alpenrallye. 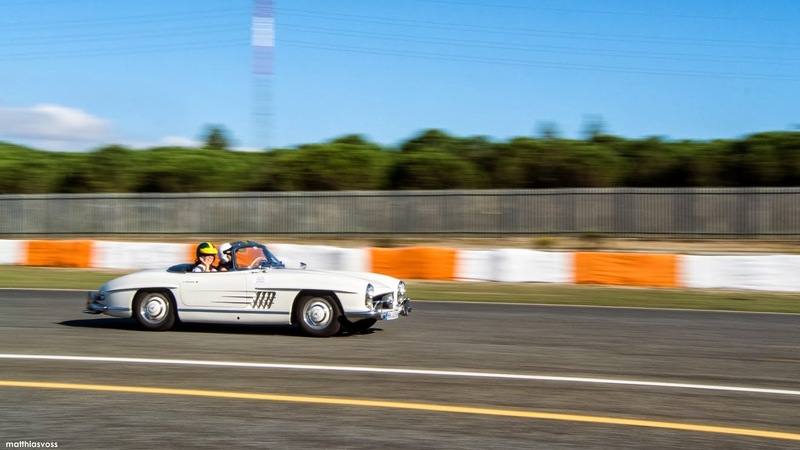 This time she entered her 1957 Mercedes-Benz 300SL into the 'Rally de Portugal 2013' - a drive organised by a group of German classic car enthusiasts. I went along for the ride - literally. 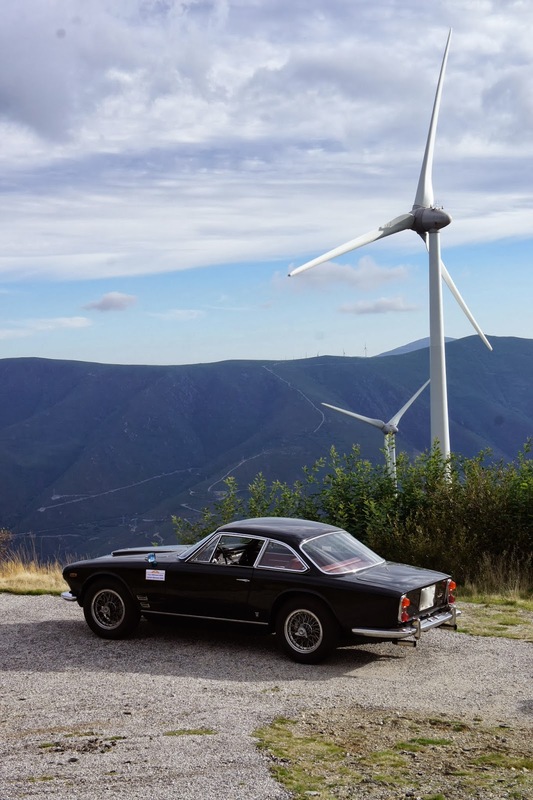 (Note: this drive was not connected to the original 'Rally de Portugal' but is an enthusiast's tour following the route of the original competition). After flying into Lisbon from London, I met 'Ze German' (Mark I as Mark II has already been mentioned in the past!) at the airport and we took a taxi on to the Hotel Palacio Estoril - on the coast just outside of central Lisbon. The Hotel Palacio is one of the finest and most historic hotels in Portugal and I was already very impressed. Here we met up with the rest of the participants and the Mercedes itself (sorry 'herself') - which had been transported along with all the other cars from Hamburg. I was really excited to the see the car - the Mercedes 300SL from the 1950s era is my all time favourite classic. Introduced in 1954 as a 'race car for the street' - it is more famous as the 'Gullwing' two-seater sports car - with the doors opening from the bottom upwards - like a seagull lifting up its wings. Our version - the Roadster ('convertible') was introduced a little later in 1957. Both have 3 litre engines (hence the 300). 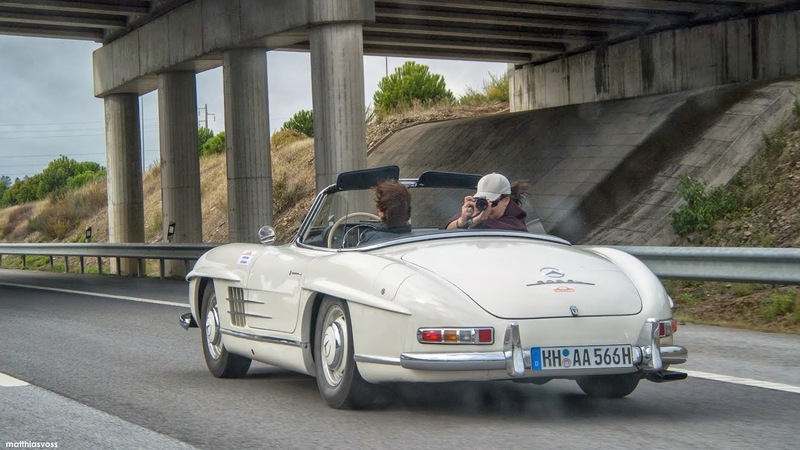 Sports Car International magazine once named the 300SL as the number 5 sports car of all time...so I am very lucky indeed to have been driven around in one! After a pleasant introductory evening with the other participants we were up early the next morning to line the cars up outside the Estoril Casino nearby to the hotel. I was thrilled as Ze German roared the engine whilst driving the car up the ramp of the hotel car park and into the sunlight. Already I could feel all eyes upon us as we purred past the entrance to the hotel in this cream-coloured confection. Time for me to put on my sunglasses and look cool. Outside the Casino, we were given a briefing but as soon as I saw that the road book was mostly in German, I knew we were going to be in trouble! (The road book is a set of step by step directions with distances, landmarks and turnings which is commonly used on such rallies instead of a map). I have not had problems navigating before on these kinds of rallies but I knew this one was now going to be a challenge. Thankfully the first day was an orientation exercise and we didn't stray far from Estoril - we all just circled the area and came back via the beach and a rather lovely long-lunch place on the rocks. 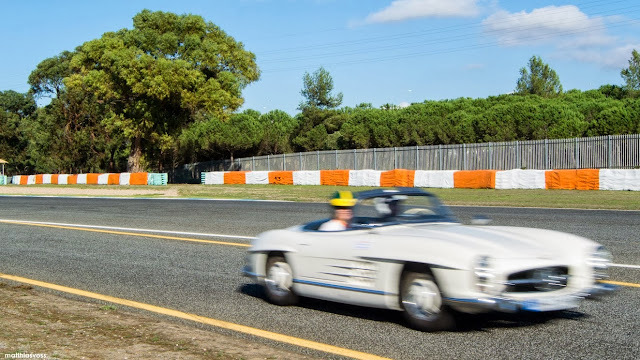 And then, in what must have been such a treat for the petrol-heads amongst the group, was the private run around the Autodromo do Estoril - home to the Portuguese F1 Grand Prix until 1997. Amongst others, the doomed Ayrton Senna won a Grand Prix there in 1985. Ze German and I sped around the Circuit twice in the Mercedes before deciding that we would rather not burn out the engine or the tyres (some blokes reading this are bound to be thinking something about 'women drivers' but we were being sensible, honest!). It was a rare opportunity to have a go on this very historic circuit and one which we appreciated. Soon after breakfast the next day, we decided to zoom off ahead of the pack not realising that everyone else would choose to stick closely together for the duration of the rally. The first few turnings were not a problem and we got quite far ahead. A Porsche 356 from our group overtook us on the motorway and I knew we were OK. But then the inevitable happened. Ze German and I got chatting and I stopped concentrating and when I pointed out all too late that we needed to 'go right!! ', Ze German shot off to the left - on to a motorway with no roundabouts and no slip roads for at least 20 kms! So unable to turn back, we zoomed along on a brand new road which didn't have a single other car on it. Not one single person to admire our car and us! By the time we had managed to re-assess the map and turn around, we had wasted 50 minutes and the other cars were far ahead of us. Then I managed to get us a lost again when we needed to turn off into the mountains as I couldn't translate the German directions at a particularly complicated spaghetti junction. When we eventually turned up at the meeting place for lunch one hour late, we nonchalantly walked in and then lied about explained how we had stopped off for a nice 30 minute coffee break and then had got 'a little caught up in traffic'. But failed to mention how I had been shouting at Ze German for not listening to my directions and how she had shouted back at me about not paying attention to road signs (don't worry, quite normal activity between us!). Ze German holds no prisoners - 110 miles per hour achieved on this lovely empty road! After that we decided to stick more closely to the group! Which was definitely more fun - as we trailed up and down mountains and through valleys and quaint Portuguese villages, some of the locals would come out to wave and admire the old cars. 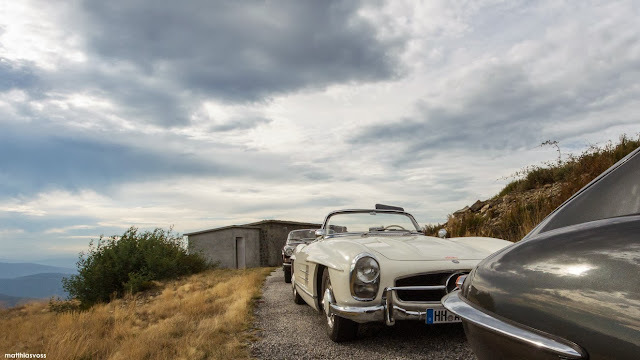 In our group were three Porsches (including a lovely old 356), three Maseratis, a Morgan, a Jaguar XK150, a Jaguar E-type and a Mercedes Pagoda. All beautifully turned-out high-end cars in tip-top condition. For two of the five nights, we stayed in two different Pousadas - historic buildings that have been converted into hotels that are actually owned by the government (much like the paradores of Spain). Our two Pousadas were old convents - skilfully remodelled into very comfortable hotels. The first convent even had a swimming pool and its own vineyard. In the second one, our hotel room was two 'cells' converted into a bedroom with an en-suite bathroom (but a little creepy). Strangely, there was an oil painting of two naked ladies on the wall of our bedroom. I am not sure what the original residents of the convent would have made of that!! The most fantastic part of the rally was the ride through the winding roads of the Serra da Estrela (between Arganil and Covilha in the middle of Portugal) Not only were the roads in fantastic condition (such a drive could never happen in India!) but they were wide and sweeping - making it an absolute joy for the Ze German to drive. As we lurched from side to side and from bend to bend, I clutched on to the handle of the door (no seat belts!) so that I didn't end up sharing a seat with Ze German. Of course there is no such thing as power steering on these old cars and the steering wheel is also huge! You will develop good biceps if you don't already have them after constantly heaving your car around bends for several hours. I am just glad I could sit back and enjoy the view and the sight of the other cars speeding up and down the hilly roads and around blind corners. Despite some very tight turns and steep inclines, we all managed to make it up to the top of a mountain (I can't remember which one) where the view of the surrounding countryside was astounding. The Mercedes performed brilliantly as always. We have nicknamed her Bianca Von Strunckel - the reason why is another long story. The E-type and Porsche 356 ahead on that lovely mountain road. After four days of mountain and motorway driving and lunches at amazing handpicked locations, we came back into Estoril for a final night at the historic Palacio. There was a prize-giving and lots of eating and drinking. The next morning we waved goodbye to Bianca Von Strunckel as she was loaded on to the truck for its return journey back to Germany. I felt very sad after the great times that Ze German and I had experienced with her. That afternoon I flew back to Mumbai via Heathrow when I would have 24 hours before my next flight to Nagpur and that Tiger Safari. See you for the next instalment! The back of the Pousada from in between the grapevines. Another scene from Circuito Estoril - the Porsche handled the circuit superbly. One of our lunch stops was at a ranch (Herdade da Chamine) where there was a film crew waiting for us. PS. Mr Jules - I really missed you! WOW!!! What beauties these golden oldies are!!! And you got a ride in one of the best. Would have loved to have the fish soup too!!! I know...Bianca is fabulous! I have to admit though...the fish soup was one of my highlights! What a dream trip, and the cars are stars, each and every one.